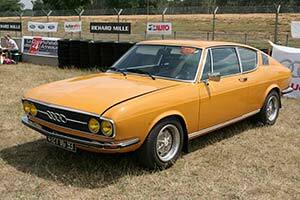 As a new car on top of the 60-75-Super 90 range (still based on the original 2-stroke DKWF102), Audi showed the 100 for the first time in 1968. Although substantially larger than the Super 90, is still used the 1760 cc 4 cylinder engine, whereby only in LS trim the power (100 BHP) seemed to be equally matched to the size of the car. (The cheaper version had 80 or 90 BHP). The Audi development team was headed by Dr. Ludwig Kraus, who had spent much of his professional life in the Mercedes racing Department. For his private satisfaction he looked at a more sporty version of the 100, and in 1969 the first model of the 100 Coupe was shown at the IAA in Frankfurt. Remarkably similar to the Fiat Dino coupe, many still consider this car as one of the most beautiful Audis ever built. (It is hard to imagine that a TT wears the same badge). The shortened chassis was good enough to accept more power, and the engine was subsequently increased to 1870 cc, and now produced 115 BHP, thanks to a double barrel Carburetor. Kerb weight was 1100 kg only so brisk movement was guaranteed. Indeed the car could easily reach 185 km/h. Alternatively the 100 BHP engine could also be had. Production started in 1970, and in 1972 a revised version was shown, whereby the engine had been reworked, in order to reduce the significant fuel consumption, and to meet emission requirements on some of the export markets. Power went down to 112 BHP, mainly because of the removal of one of the two carbs. Although looking very elegant and stretched, the car's length is only 4.4 meters, but with a width of 1.75 meters, it made quite an impression on the motorway. Rust prevention was not the strongest part of the production process and only very few of these beautiful cars have survived. Production stopped in 1976, and in total 30787 cars were made.